Compleat Golfer assembled a panel of golf writers and influencers to talk through the moments that will shape the game in the year ahead. Name one male player yet to win a Major who will break through in 2019. Gary Lemke: When you see how much talent there is out there it’s so difficult to pick just one name. Bryson DeChambeau, Jon Rahm, Tommy Fleetwood, Rickie Fowler … wow. OK, I’ll go for someone less ‘obvious’, Haotong Li. We’ve been waiting for ‘the Asian arrival’, and Li might just be the man. Wade Pretorius: The heart says Rickie Fowler, but the head says Tommy Fleetwood. Fowler must be the best player in the game without a Major to his name. After a few years of misses, he will get it done this year. Dale Hayes: Jon Rahm. He has the power, plus a fantastic short game. Most of all he has the desire to be Spain’s next Seve. Denis Hutchinson: I think the obvious one is Rickie Fowler, who has come close so many times and probably deserves a Major. Which South African will fare the best at the Majors in 2019? Lemke: Probably been saying this for a while, but Branden Grace. Pretorius: I’m not sure there’ll be much success, but Louis Oosthuizen’s game is looking promising. Hayes: I sense a new attitude in Charl Schwartzel. If he sets his mind to it totally, the sky’s the limit. Hepburn: Branden Grace. He looks to be hungry for a Major. Hutchinson: South African players had a disappointing year in 2018, particularly at the Majors. Louis played nicely at Sun City and has come second at every Major, so he should do well. I’d also expect Branden Grace to win an Open Championship at some point. Will Tiger Woods win a Major in 2019? Lemke: No. He’s going to stay a superstar who ‘fluked’ 14 Majors (laughs)! His first victory in five years was undoubtedly the comeback story of 2018, but he has just turned 43, and as much as I’d love to see him add to his 14 in pursuit of Jack Nicklaus’ record 18, there are too many good players for Tiger to get it right in a Major week. Pretorius: This is probably an unpopular view but I say no. His best shot remains at Augusta, where he knows the course so well, but the field is too strong, with too many options, for him to walk it in. It just gets harder, with more variables, as the Major season progresses. Hayes: I think Tiger could win a Major in 2019. He’s got the taste for winning. His long game is better than it has been in the past 10 years and his nerves on the greens are superb. Hepburn: I don’t think he will, although his comeback has been remarkable. Hutchinson: Well, I never thought he would, but he might now. His comeback has been remarkable, but it’s still only a might. What is the tournament you’re looking forward to most in 2019? Lemke: I’ve never been within a hundred miles of Royal Portrush, but the golf course experience seems amazing. One of the great links courses in the world, the Northern Ireland club will host The Open Championship in 2019 for only the second time. Pretorius: I guess most will say The Masters, but for me The Open is going to be special. 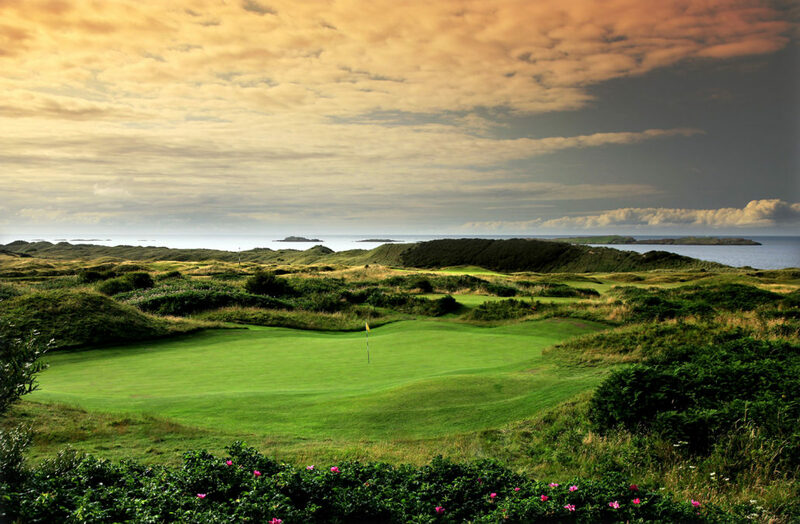 I can’t wait to see how Royal Portrush shapes up. Hayes: The Open Championship at Royal Portrush. It’s one of the world’s great old golf courses and is full of genuine golf fans. An extra plus is that it will be the last Major of the year. A win by Rory McIlroy would be spectacular. Hepburn: I always enjoy The Open and am often fortunate enough to attend the tournament. In 2019 it is in a particularly beautiful part of the world. Hutchinson: It has to be The Open, which I look forward to every year. It will be special at Royal Portrush because they haven’t played it there since 1951, during the Bobby Locke years. The last time I was there was when I was commentating at the Irish Open in 2012 when Jamie Donaldson won. I believe there have been a few changes to the course since then, though. Who will win The Presidents Cup between the United States and the Internationals at Royal Melbourne later in the year? Lemke: In 12 previous events the US have triumphed 10 times, with one International victory and the tie at Fancourt in 2003. Compared to the Ryder Cup where the US have their work cut out against Europe, it’s strange the Internationals have such a poor record. I can’t see it changing this year. For me, the Internationals don’t have the same gees or brotherhood the Europeans have – and that’s a huge factor. Pretorius: The Internationals by a whisker. Hayes: The Internationals’ only win came in Australia, so I think they can do it again. There will be a few new players in the team, like Haotong Li, and they will all play hard for Ernie Els. Hepburn: I think it will be tough to beat the US, who will have a point to prove after Europe beat them at the Ryder Cup. Hutchinson: Well, the last time we won it was at Royal Melbourne, so I’m going to go for the Internationals to take it. What is your favourite experience of watching golf live on TV? Lemke: The ball-flight tracker and Hawk-Eye. It’s changed my viewing experience. What I don’t like is when the leaderboard only shows the first 20 players or so. Pretorius: The Ryder Cup can’t be beaten for TV viewing. The roars, the limited field and the guaranteed Sunday drama. That said, I do my fair share of shouting late into Masters’ Monday morning. Hayes: Definitely the Ryder Cup. This year I must have watched 80-90% of the golf and it was awesome. Hepburn: When a friend is in contention to win a big tournament, one can almost feel the tension. Hutchinson: I love seeing courses I have played in the past that I haven’t seen for a while. I mean, golf courses are the most beautiful playing fields in the world. What changes would you like to see introduced to the sport? Lemke: Evict any spectator from the course who shouts, ‘Get in the hole!’ when a player is teeing off on a par five or making an unlikely approach on a par four. Pretorius: I’d argue the game is fine just the way it is. There is enough experimentation with the shot clocks and sixes to test its reception to change. Hayes: Let’s remember that real golf is the 50-million amateurs who play. Unfortunately, they copy the pros and their one bad habit is slow play. I’d like to see slow players on Tour being penalised. Not a money fine but a two-shot penalty. That will speed them up. Hepburn: Perhaps a relaxing of strict clothing attire during social rounds of golf, as the new generation tends to view golf’s traditional dress code as being ‘uncool’. Hutchinson: The ball needs to be brought back. Courses are being stretched because what used to be a driver, 4-iron is nothing more than a driver, wedge for the players. So we have lost the 400m holes. Yes, we can tighten up courses like they did at Le Golf National for the Ryder Cup, but ones like St Andrews are being humbled because on a windless day, players are driving most greens. What would you like to see eliminated from the sport? Lemke: Cheating. It’s rife at many levels. I don’t know how to eliminate it, but I’d like offenders to be named and shamed. Pretorius: Without a doubt, the ‘Baba boey’ and ‘Mashed potatoes’ crowd. It’s senseless and does nothing for the game (this could apply to the previous question too). Hayes: I’m sad to say, but cheating is a problem that is hurting golf at every level. Club members don’t want to play at national events because others cheat their handicaps. A few are hurting the game for so many. Hepburn: The shouting by fans at golf courses during tournaments, particularly the ‘get in the hole’ brigade. Hutchinson: I’d like to see them take out yardage books, so that players go back to ‘eyeballing’ the course. There was a real skill in that and a feel for distances. Lemke: Yes. And I’m not going down that equal-pay route. Some clubs still ban women from membership. What courses have had holes designed with how women play the hole? But sexism works both ways. Why can’t male pros wear shorts? Pretorius: Not in my opinion. Does women’s golf get any less money or coverage than its cricket equivalent? Hayes: Golf has improved greatly over the past 10 years. Yes, there are still a few clubs (none in South Africa) that don’t allow women, but it’s a very small number. Hepburn: Golf has come on in leaps and bounds in terms of addressing this issue. It probably has some way to go, but I think the good news is that the sport is moving in the right direction ,with all sorts of initiatives, not to mention professional events with men and women teeing it up at the same event. Hutchinson: No, I don’t think so, why should it be considered sexist? How would you grow the game? Lemke: Make golf cheaper – how any South African course can have a R1 000 greenfee for 18 holes is beyond me – and have golf sets that can be used for free at courses. Pretorius: Make golf more affordable for the masses. Make membership fees more affordable across the spectrum. Hayes: Golf can never be a cheap game. It’s already cheaper than it should be in South Africa. A golf course is 60 or so hectares, not a small tennis court, and it costs hundreds of thousands of rands to maintain. We need to tell people what is special about the game. Why do all the top athletes in other sports gravitate towards golf? Because it’s the best game, period. Hepburn: It needs to be more family friendly, from the on-course environment to the one around the clubhouse. Courses that have done this have seen a marked increase in numbers and success. Hutchinson: The game has become so expensive. It costs R20 000 for a set, and joining clubs has become prohibitive. When we were kids it cost us almost nothing. In 1971 I bought a Mercedes for R4 800, and now you’re paying R9 000 for a new driver. We’ve got to make the game more affordable. – This article first appeared in the January issue of Compleat Golfer, now on sale!